The LG K10 is shaping up to be a competitive budget phone that runs Android. While Motorola has impressed us the most before, this K Series entry for 2016 has a smoother design and rocks a large, 5.3-inch display. Be fearless and trust your intuition. Capture life precisely as you see it, and take selfies that reveal the true you—confident and tenacious. Discover extraordinary style and power that’s ready to go… and go. With the LG K10 LTE in hand, there’s nothing you can’t do. You are unstoppable. See and be seen. Your new look is crafted to perfection with a sleek, glossy pebble design. The smooth glassy screen of LG K10 LTE delivers a comfortable grip with a delightful feel. When one picture won’t cut it: just raise your hand, align it in the box, and make a fist TWICE to capture 4 selfies in sequence. Light up your life with a screen that glows around the photo preview for the ultimate selfie expression with 5MP front camera. Life’s an adventure—don’t miss a moment of the action. Focus in and capture it by simply touching the screen. Take crystal clear images with 13MP autofocus rear camera. LG K10 LTE's HD display delivers vibrant colors and clear images even in bright sunlight by reducing internal reflective-light. Have all your needs met with the LG K10 LTE's 1.2GHz Quad-Core processor capabilities and experience the power to effortlessly multitask. The LG K10 Mobile Phone was added to the Mobile Cell Phones category in June 2016. 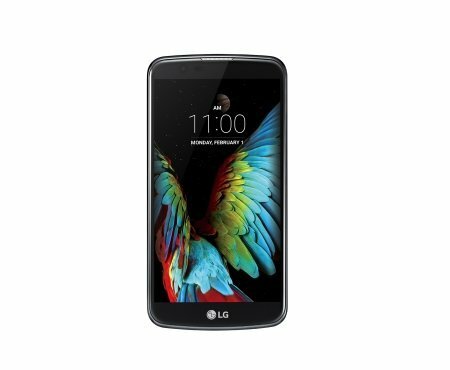 The lowest price GetPrice has found for the LG K10 Mobile Phone in Australia is $240.00 from think of us.